For a small city, Boulder has a wealth of cultural and artistic offerings. Many artists call Boulder home; their work is often featured at the town's galleries. The drama and music departments at local universities draw performers. Various film festivals take place throughout the year. Whether you're looking for music, movies, art, or dance, you'll find plenty of offerings in Boulder. We've listed some of the most popular art and entertainment venues below. The Boulder Theater was originally opened in 1906 as an opera house. Today, the venue hosts a wide variety of performances in a classic art-deco setting. Performers include nationally-known songwriters and world music ensembles. The two onsite bars keep the mood fun — especially during annual screenings of The Big Lebowski, when patrons stroll through the theater in bathrobes sipping White Russians. The theater is located just off the Pearl Street mall at 2032 14th Street (map). Telephone: (303) 443-3399. The Fox Theater is located on University Hill next to the University of Colorado. A popular place for college-favorite bands, the Fox has hosted Dave Matthews, Sheryl Crow, and Denver-based The Fray when these performers were beginning to develop a following. You might find the next rising star at the Fox these days! The theater is a small, intimate, mostly standing-room space. The Fox is located at 1135 13th Street (map), and the box office number is (303) 443-3399. The Dairy Center is Boulder's home for theater and dance. Located in a former dairy processing building, the Center is now a hip place for art and theater. Multiple galleries and show-spaces feature the work of playwrights and artists. Spoken word poetry and monologues are common, as are one-act plays. The Dairy Center also hosts the famous Aerial Dance Festival and other dance performances. Located at 2590 Walnut Street (map). Box office: (303) 440-7826. The historic Chautauqua Auditorium, located within the scenic Chautauqua park, hosts a wide variety of singer-songwriters each summer. Recent performers include the Indigo Girls, Shawn Colvin, and David Wilcox. Also popular is the Wednesday night silent film festival. The auditorium is located in Chautauqua park off of Baseline (map). Box office: (303) 440-7666. Boulder doesn't have a dedicated art-house movie theater. However, the International Film Series at the University of Colorado fills the gap by showing over 100 foreign and art-house films each year. As an added treat, directors occasionally attend screenings of their films and answer audience questions. Films are shown at the Muenzinger Auditorium and other locations on the CU-Boulder campus. Admission fees are $5/person ($4 students). Call (303) 492-1531 for information. Summer visitors will enjoy the Boulder Outdoor Cinema, which shows classic and second-run films under the stars. Watching films at the BOC is fun, light-hearted, and community spirited. Friday night films are family friendly; Saturday offerings are more adult-oriented. Perennial favorites include the Princess Bride, Raiders of the Lost Ark, and Star Wars. Bring your own chairs (or blanket) and arrive early to grab a space. The location is in a parking lot at 1750 13th Street (map). For information and schedules, call (720) 317-7498. 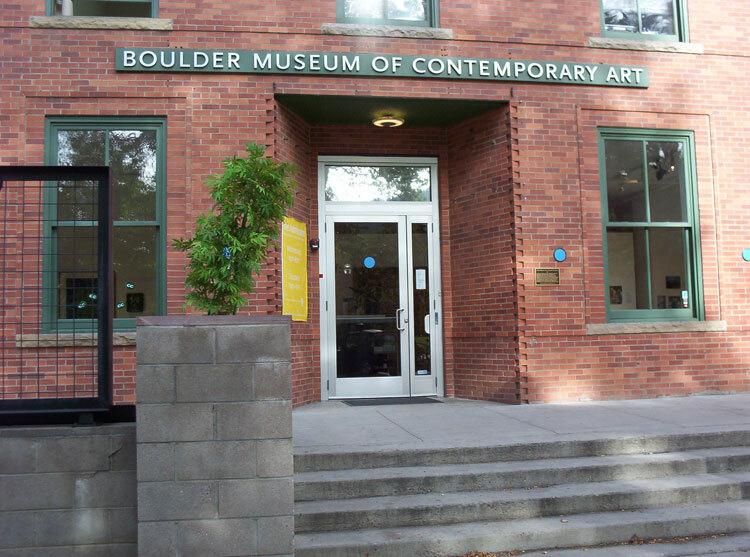 The Boulder Museum of Contemporary Art — or BMoCA as the locals call it — was founded as the Boulder Arts Center in 1972. Today the museum showcases a variety of contemporary art in its three galleries. In addition to the exhibits, a top-floor black box theater hosts live performances, film screenings and artist lectures. BMoCA is located downtown at 1750 13th Street, next to the Dushanbe Tea House (map). For information on current exhibits, call (303) 443-2122. Boulder is also home to a variety of art galleries. The "first Friday" art walk is a fun way to visit the galleries (and sip a glass or two of wine) on the first Friday evening of each month. The Open Studios tour in autumn allows art lovers to enter the studios of local artists and discuss their work in-person. For information on Open Studios, call (303) 444-1862. The University of Colorado's music department hosts a variety of operas, oratorios, and classical music concerts throughout the year. These generally take place at the elegant Macky Auditorium or the Grusin Music Hall on the CU-Boulder campus. Artists include both internationally-known performers and rising stars from the CU College of Music. Past performers have included such luminaries as Isaac Stern, Wynton Marsalis, Van Cliburn, and the Martha Graham Dance Company. For information, call (303) 492-8008. You can also visit our Yearly Events page for information on the annual Shakespeare and Bach festivals.